WASHINGTON (Sputnik) - The National Football League (NFL) adopts a policy this year that fines players who disrespect the American flag and national anthem, NFL Commissioner Roger Goodell announced on Wednesday. "A club will be fined by the League if its personnel are on the field and do not stand and show respect for the flag and the anthem," Goodell said in a statement. He added that the series of protests last year that saw players taking a knee during the national anthem depicted the league as unpatriotic. 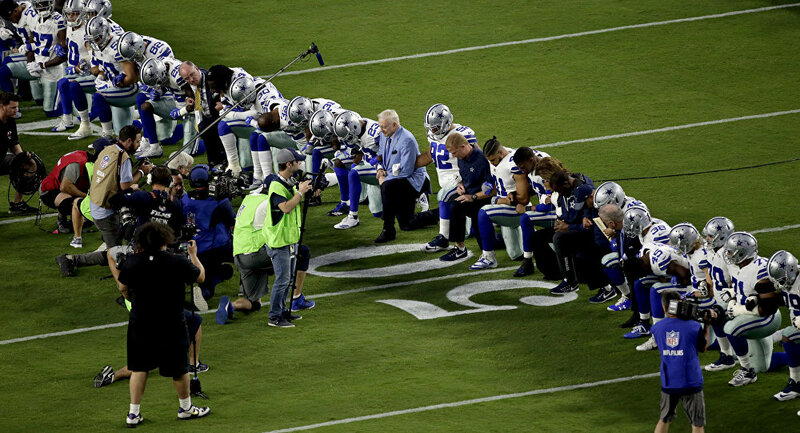 NFL players have knelt during the national anthem to protest against what they call the US justice system's unfair treatment of African-Americans and other minorities. NFL players and owners have defended the protests as an exercise in free speech, a right protected by the US constitution. The NFL Players Association said in statement that the union was not consulted by the league about the new policy. The union added that it would review and challenge any provisions in the new policy that are inconsistent with their bargaining agreement with the league.